This article, was supposed to be my submission into a joint book that a bunch of people have written. But it seems to have not seen the light of the day any time soon. I just do not like to write a bunch of things and it not seeing the light of day. So I decided to put it out on my site now. This is an analysis of a company which I own. The price have ran up a little but I thought it would still be worth it to bring to your attention. I would try to do less of those horse back carriage front kind of things where I told you “I bought this stock when its distressed and look how great I am” posts. Their results should be out in early March and I thought it has a pretty interest mix of profile that you can be aware about. The recent share price trend. Note that it has not been listed for long, since it was spun out of The Wharf not too long ago. In times like this, where the market is down, I think I would provide investors with a simple to understand investment that might rest at a very sweet spot. 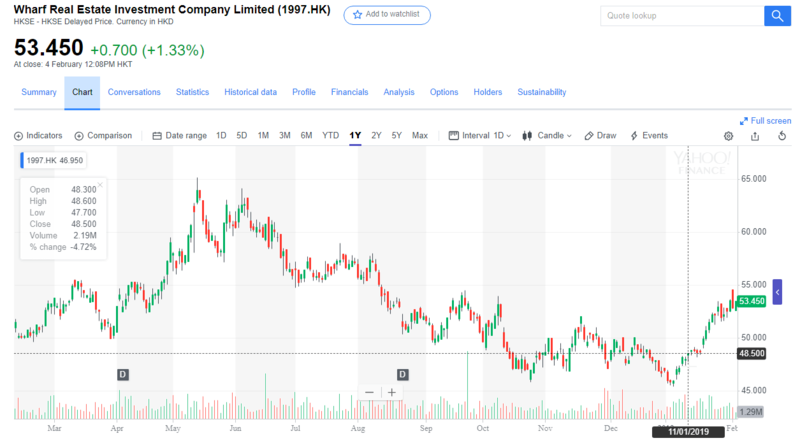 In Nov 2017, Hong Kong listed The Wharf (Holdings) decide to spin off some of their core properties into a new company called Wharf Real Estate Investment Company or Wharf REIC. Wharf REIC was listed at HK$48 and reached a higher of HK$63. It is currently back at its debut price. After this separation, Wharf Holdings would focus their efforts on investment and development in Mainland China. I would say, Wharf REIC is the cash flow machine of Wharf Holdings. The owner basically spun off 60% of its EBITDA generator into a new company. By being a real estate investment company, rather than a REIT, Wharf REIC is not limited by having to pay out 90% of their income as dividends, only using 10% of asset allocations for development and a 45% maximum gross debt to total asset ratio. 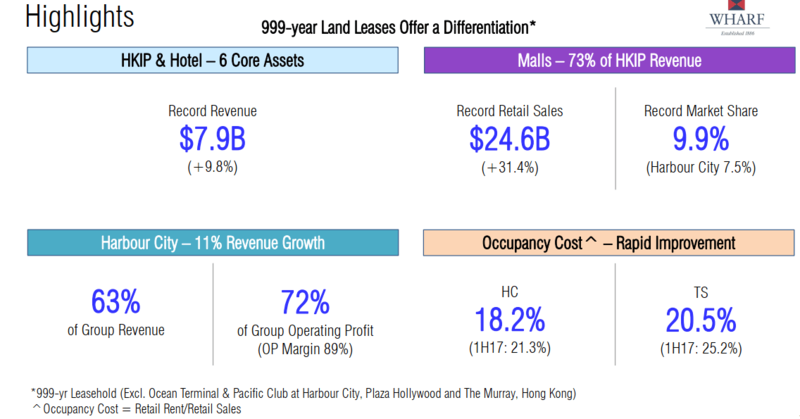 Wharf REIC have the largest retail portfolio by size of investment properties in Hong Kong. This is bigger than Sun Hung Kai Properties and Link REIT. The portfolio is anchored by 2 very prominent retail malls Harbour City and Times Square. Given this, 70% of the revenue are derived from Hong Kong with the rest from China. One of the attractiveness of Wharf REIC is that they are committed to pay out 65% of their earnings as dividends. Management have guided that they will use the other 35% to pay down their debt. 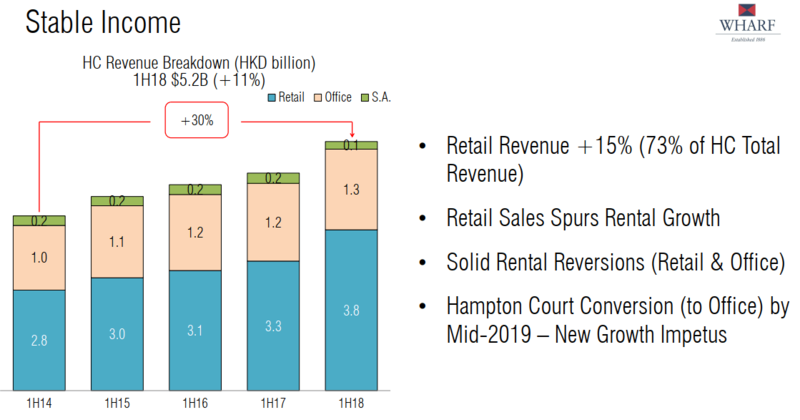 Compared to other Hong Kong property stocks, Wharf REIC do not pay out the maximum, but provides a higher pay-out then the other property stalwarts such as CK Asset, HK Land, Swire, Sun Hung Kai. The pay-out ratio allows the investor to earn some decent low leveraged pay-out. However, the main attractiveness for me is the quality of the property, and the cash flow that the properties generate. 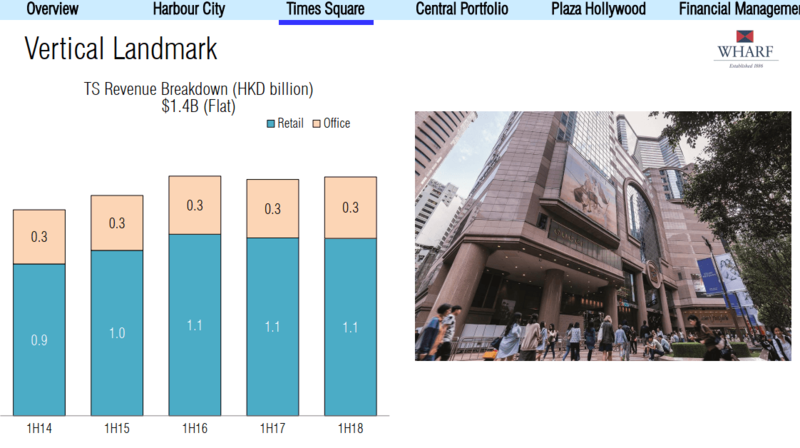 The majority of the cash flow is driven by Harbour City and Times Square, which are main tourist attractions in Hong Kong. These are trophy assets located at the heart of Tsim Sha Tsui and Causeway Bay. The main retail attractions are in superb locations and investing in Wharf REIC allows the investor to tap into the superior retail management abilities of the manager. 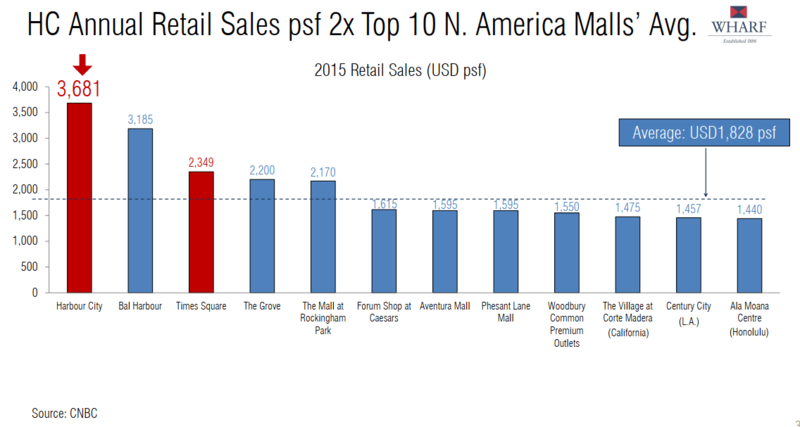 By virtual of their strategic locations, strong connectivity, these 2 retail malls enjoy very good footfalls. Due to their size, they cannot be easily replicated as well. To give you an idea how big Harbour City is, the total gross floor area is 8.43 mil square feet. The largest mall in Singapore, VivoCity, is 1.5 mil square feet. Harbour City is 5.6 times the size of VivoCity! Times Square have a gross floor area of 1.98 mil square feet. The total revenue of Harbour City increased by 11% in 1H 2018. Retail revenue rose by 15%. Wharf REIC average passing rent grew by 14%. The recurring earnings per share is HK$3.31. At the current price of HK$48, this is a recurring 6.9% earnings yield. Because of the low leverage, this puts the unleveraged earnings yield possibly around 6.05%. This is higher than a lot of the local REITs, if they are unleveraged. Harbour City, is a powerhouse. Notice the declining sales growth and yes the rental revenue growth has decline, but it is still growing! Times Square rental growth is a bit flat though. Wharf REIC is a play on recovering tourist spending in Hong Kong. The weighted lease expiry of the leases is 2 years. Short leases are excellent if you have a strategic retail moat. This allows the manager to not missed out on growth. Unfortunately, short leases are double edge swords. It means that if tourist numbers ae not good, this would affect Wharf REIC. In terms of debt, their gearing is lower than REITs. The current net debt to asset is 15%, net debt to equity is 20%, which is very manageable. The groups average borrowing rate in 2017 is 1.5%. All the debts are unsecured. Their debt is in Hong Kong dollars so there is no exceptional currency risk there. Wharf REIC’s valuation Cap Rate is reasonable. 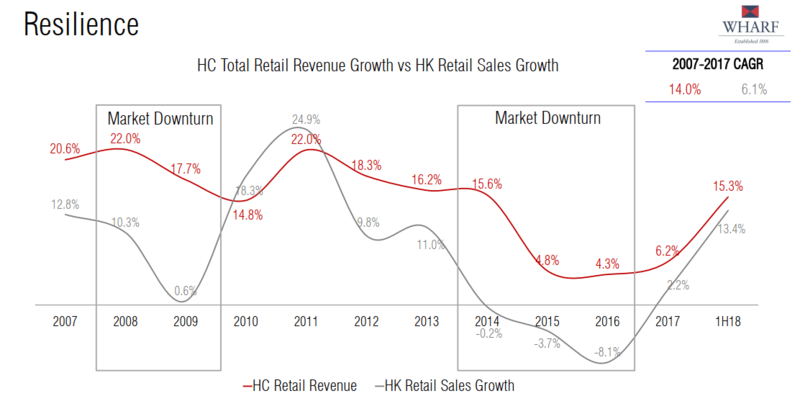 For their HK Retail, the Cap rate used is 5.2%, for Office, the Cap rate used is 4.2% and residential 4.5%. This is probably a little higher than Cheung Kong Asset’s cap rate for their office of 4.75%. To me, Cheung Kong Asset valuation cap rate tends to be rather conservative. We talked about the Cap Rate because it ties closely with how the properties are being valued. In that way we can determine whether the properties are attractively valued. The net asset value of Wharf REIC is around HK$220 bil. Wharf REIC’s current market capitalization is HK$163 bil. Thus, Wharf REIC trades at a 26% discount to net asset value. It should be noted that a lot of property companies in Hong Kong trades at a large discount, so this is not very special. What I like about Wharf REIC is that based on recurring earnings yield, the profile of properties, and the low leverage, it shines amongst the competition. Its dividend payout ratio is conservative, committed to pay out a certain percentage, and back by a cash flow. Assets are high quality and leverage is low. Majority of the income stream is backed by assets that have long land lease. It is clean and less complicated. Its debt is low, and its short lease works well in an environment where interest rate is rising. Any withholding tax on the dividends?